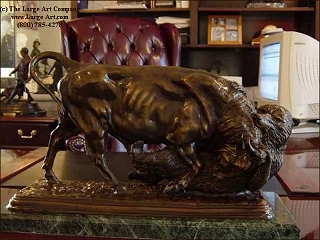 For all you Wall Street buffs out there we are pleased to present this magnificent bronze sculpture of the classic fight between the Bulls and the Bears. The original of this sculpture was completed by Isidore Bonheur in the late 1800's. If you or someone you know is in the financial services industry this is an awesome gift! You can see the bear holding on for his life as the bull pounds him with his horns. The bear's sharp teeth are gripped onto the bull's neck in a desperate attempt to avoid defeat. A real classic piece of sculpture cast in pure bronze to last forever! This sculpture is created in 2 sizes. The original size is 22" long x 14" tall. It is perfect for a centerpiece of a desk or credenza. The smaller version is 11" long x 8" tall. Both are nice, but the original size is quite an impressive piece of sculpture. Click the image above for a pop-up window with several more photos of this sculpture.